We aren't joking when we say physical switches are essential to any smart home. Sensors and automation go a long way to making a home useful, but it is still hard to live without physical switches and buttons. If you're reading this, you're probably fine with controlling everything from your iPhone. But, when you set up your system, you still need to consider kids, guests, the older generation, or a spouse who simply does not want to yell "Hey, Siri" every time they want a light to turn on. Or, worse yet, break something you've got set up by turning off a switch. HomeKit has started to embrace this recently with many new buttons coming to market. Philips Hue Tap and Dimmer, Elgato Eve Button, and Logitech Pop have already hit store shelves, and now we have the latest entry from Fibaro. The Button actually debuted quite a while ago, but solely with Z-Wave support. After a small delay, a HomeKit variant has also been released. We love this kind of retro design embraced by The Button. It somehow looks like a retro and modern at the same time, blending into many environments. There are eight different color options for The Button, but we kept it simple with the white version. A small battery powers The Button, which is easily accessible by depressing the button, then rotating. It then comes apart into two pieces, with the battery sandwiched between. To mount the button, a simple foam sticker is included. For a more permanent solution, there is a minuscule mounting plate on the back of The Button that comes off after a small twist. 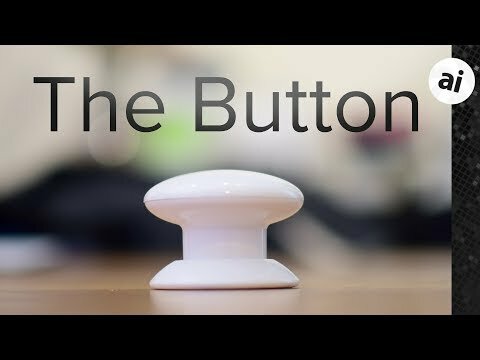 Remove it from The Button, screw it into the wall, then twist The Button back into place. When the button is hit, there is a nice movement in The Button and an audible click letting you know you've invoked the action. This is a much more satisfying feeling than the muted buckle of the Logitech Pop. Optionally, a diminutive beep can be enabled to let you know when an action has been triggered. Compared to Z-Wave, The Button only has 3 programmable functions for HomeKit -- one press, two presses, or a hold. Z-Wave gets six commands corresponding to different button presses. This is actually a limitation enforced by Apple, most likely to keep things simple. It is this simplicity that also gets in the way with HomeKit. Apple only allows you to set a single command to each of those three functions. So in use, you press the button once and your living room lights turn off. But... how do you turn them back off? You could set a countdown timer that would revert the scene after a set amount of time in the Home app, or you can program two presses to turn of the living room lights. This is totally unnecessary and a bit confusing. It also reduces the amount of things you can control. Luckily, by relying on third-party HomeKit apps, buttons can be programmed to be more intuitive. For instance, instead of one press for on, two for off, conditionals can be used so that one press turns the lights on, and another single press turns them back off. What happens is that when you press the button, it checks if the light is on or off, and then does the opposite. The same premise can be used for any number of other smart home devices such as locking/unlock a door, closing/opening a garage door, raising and lowering blinds, turning a fan on/off, and so much more. More complex scenes can also be programmed. Instead of just controlling a single device, that one press can turn off all the lights, lock the door, adjust the thermostat, close the garage, and enable the humidifier. Unlike the Logitech Pop button, The Button doesn't require a hub. It simply connects over Bluetooth. When smashing The Button to trigger a scene or command, there was no more than a half second delay before the action took effect. Especially if there are conditionals added, hitting the button repeatedly in quick succession did seem to confuse our HomeKit setup. Just waiting a moment before trying to perform the action again made everything work once more as expected. HomeKit buttons or other switches really make a smart home easier to use. Fibaro even includes multiple mounting options that make it easy to put within reach for everyone. Put one really low next to the bed for kids, right on a desk to toggle all of the lights, or as a master switch in the bedroom to put the house into night mode. The Button is also much more recognizable than either the Pop or the Eve Button. When someone sees The Button, they know exactly what to do with it. It actually is quite fun to smash it with the palm of your hand when mounted on a desk or the wall. Of all the HomeKit buttons that have come to market so far, The Button is the most accessible to non-tech users. A high price is one of the biggest disadvantages, alongside the lack of guidance on setting up toggled actions. Fibaro's app is a bit bare bones, and most users will end up with simple commands that could be vastly improved with instructions on conditionals like we see from Elgato. Those conditionals can be set up with The Button, Fibaro just doesn't teach users how to enable them. To pick one up, The Button with HomeKit can be found on Amazon for $59.99, which is a $10 premium over the Z-Wave version. I use Philips Hue dimmer switch 4 programmed buttons for activating scenes and automations. Cheaper and easier to use if you already own Philips Hue bridge. I think the point is to not have to use a bridge, given that this is a native HomeKit solution. Can it used as an emergency button for calling 9-1-1? I like iDevices instant switch more even if it isn’t really HomeKit compatible. You can stick it to the wall and it looks like a wall switch. It even can sit behind a regular faceplate. The fibaro looks unattractive to me. And that works like The Button, or does it only turn on/off what I assume is a passthrough A/C outlet? It will only work with iDevices products. So there is a few including an outdoor outlet, indoor outlet, wall switch, and in-wall outlet. lack of actual HomeKit support is a big bummer. Really makes it a lot less useful unless you own all iDevices products. And what is supposed to be good about HomeKit is being able to use any manufacturer. I like both, honestly. I like my iDevices Instant Switch on the wall, but I like The Button on my desk. I actually really like the look of it! Like Mike said, this is only useful if you have a Hue setup already. I use these in my bathroom and it only works 90% of the time compared to The Button which is about 99% effective in triggering scenes. The big problem is you have to deal with Fibaro. Their Home Control 2 is an unmitigated piece of garbage and the US Representative is a tool. The Customer serve is a joke. I spent three years banging my head against a wall trying to get their system to do that they said it would, only to find out it wouldn't. When I was Z-Wave Based I I changed from the Fibaro headache to the Smarthings bridge and stuff that Fibaro only promised to make work did. Seriously when company sells a $800 controller and it wont natively recognize a Jasco wall dimmer (The most popular Zwave dimmer on the planet) they have a problem. I think we will see a ton of HomeKit devices this year, now that Apple stopped requiring a physical chip in each device.